This is what my friend got. I seriously hope we get something "slightly" better than this blobman who tries to look like captain Picard. I mean I'm assuming to get exactly same quality than in Modiphius pictures. That doesn't look surprising. If anything, it's closer in quality to the CGI previews than several Kickstarters I've pledged for (from other manufacturers). It's soured me on pledging for Kickstarters with CGI previews vs. "greens," but I've seen previous Modiphius minis that looked pretty good, IMHO. Oh I tought they are basecoated minis. But I'm seen better detailed 25mm scale. You can't even see the badge properly but a lump. For me miniatures are tiny pieces of art but now they look closer to something you can found from advent calendar so I'm highly disapointed. Wow. I seriously hope the quality is of higher caliber than this, We have a decent sized gaming group that is very much looking forward to Fallout. I can honestly say the majority of it has to do with the miniatures themselves. Anyone get some close up pics at gencon maybe? Jordan do you have any pictures of good Modiphius minis? I'm getting pretty worried right now. @KimmoP: What I mean is, this seems to be within normal parameters (maybe even on the high end) for the difference between the sharp, highly-refined CGI models we often get to see in previews from various miniatures manufacturers, and what we actually get when those are actually translated into plastics. Just to be sure we're talking about the same thing, though: Was your friend's miniature a resin cast, or was it HIPS (high impact polystyrene) or PVC, or some other form of plastic? That's one of the factors that has come up during discussion about the release -- how there was going to be a version of the game with high-quality (and more expensive) resin casts, and then also the more general (and presumably more price-conscious) plastic release. Resin casts tend to have a lot sharper detail, closer to what the CGI preview looks like, partly because flexible molds allow for more convoluted mold line points, and for deeper recesses and sharper edges -- though they can still be vulnerable to a certain amount of distortion (warping in the mold itself), or bubbles in the resin, which depends on a bit more quality control on the part of the miniatures maker to make sure such flaws don't make their way to a customer. This lends itself more toward "boutique" mini projects, since the technology involved is potentially something you can do in your own garage, and the overhead for starting production is relatively low. However, most casting resins that I know of tend to be very harsh on the molds, and the molds experience noticeable degradation after just a few casts. Therefore, in order to keep the quality of output high, new molds have to be made (from masters) fairly frequently. Some smaller outfits may attempt to squeeze as much as they can out of old molds, however, resulting in greater variance in quality between individual casts (you get lucky if they were from a fresh mold -- not so lucky if it was a bit worn down but just not bad enough to be thrown out yet). Similar considerations apply to pewter casting, but pewter is something that you have to heat up and pour into a mold, then gravity-spin it while the pewter is still hot in the hopes of getting it into all the recesses, and forcing any bubbles into the vent outlets carved into the vulcanized rubber molds. As such, miniatures with lots of thin and spindly details are harder to cast properly -- there's an increased chance that the pewter is going to cool down too much before it gets into those recessed areas, and if you have too many deep recesses in the cast, the cooled and hardened mini is more likely to grab, tear, and gouge out those bits of the rubber mold when it's extracted. Thus, pewter minis that are optimized to the process tend to have thick limbs (or an arm folded against the body, etc. ), big guns, and generally more compact profiles than what's possible with resin. Plastic injection allows for more cost-effective mass production, though there is a very high initial cost for the tooling of the metal molds themselves. Once those molds are made, a typical gaming mini cast from it might cost mere pennies to produce, though the manufacturer is going to have to churn out and sell thousands before he can hope to recoup costs for the mold. Plastics that solidify fairly hard must be machined in such a way that there are NO recesses on any surface in such a way that you couldn't remove the piece smoothly from a hard mold -- so miniatures cast in such a way might have deep detail in, say, the facial area, but the sides of the head (where the mold line breaks) are going to be fairly smooth. For a long time, as far as miniatures companies went, this was only practical for making things such as a standardized base (e.g., "Slottabase") that you'd be using across miniatures in your entire range. Since the same base would be used for just about every mini you produce, you know you're going to be putting it out in volume, and the base doesn't have much deep detail at all, so it is easy to produce and pop out of molds quickly. Plastic minis produced in this way tend to be very toy-like in their detail, or else multi-part (as that allows you to make each piece have its own mold-lines, and allows for the final figure to be positioned in poses that would be impossible to cast in a traditional molding process). But then, there's also plastic injection with various types of "softer" plastics. Softer, "bendy" plastic allows for a little more forgiveness in the surface detail, because even if there are recesses on the side of a figure near the mold break lines, you can still "pop" it out of the mold, because the plastic itself is flexible. The trouble is that these same plastics tend to have a certain, tiny amount of "shrink-back" when they solidify, and they just don't generally hold sharp detailed edges as well as resins, pewters, or hard plastics. I've never worked with these, so I don't really know anything about the various methods that might be used to compensate for this. I gather that there is a certain amount of experimentation that can be done with the mix of the plastics involved -- trying to find the perfect trade-off point where you get the plastic to be as hard as you can, but not so hard that you can't pop it out of the mold without damaging something in the process. I think that's been evident in the development of the "Bones" plastics from Reaper Miniatures, as they've tinkered with their plastics -- some of their earliest figures suffered greatly from the delicate little noses on female figures becoming smoothed almost entirely away once cast in soft "Bonesium" plastic. Since then, the "Bones" plastic has tended to be a little more rigid and less "bendy" -- and for certain figures and pieces (e.g., the wings on their clockwork dragon "Wyrmgear" which are more flat and machined, and cast in a more rigid plastic) it's obviously a very different plastic mix. Another possible factor: Certain plastics are not ENTIRELY opaque. 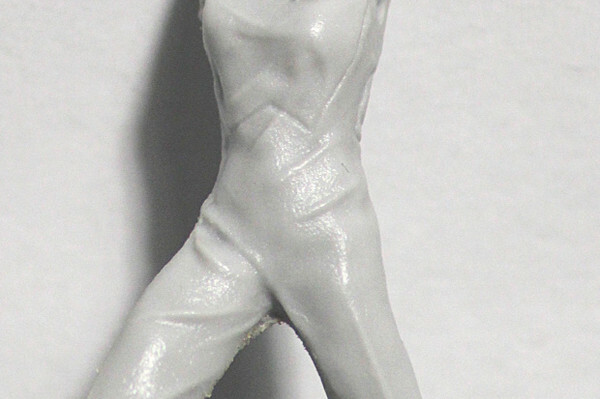 Certain "Bones" minis from Reaper, for example, have a certain soap-like quality in terms of slight translucence rather than complete opacity. What this means is that thicker areas look more solid, and narrower details look slightly translucent, which has the illusion of muting such irregularities and "smoothing" the general appearance of the figure. I would say that actually painting the figure cancels out this effect, but I must also consider that paint has THICKNESS, so depending upon what paints you're using, a base coat may not necessarily solve the problem entirely. TLDR: If you're really particular about the fine, fine details, *if* Modiphius offers the option of PVC or HIPS vs. resin casts, go for the resin cast version. 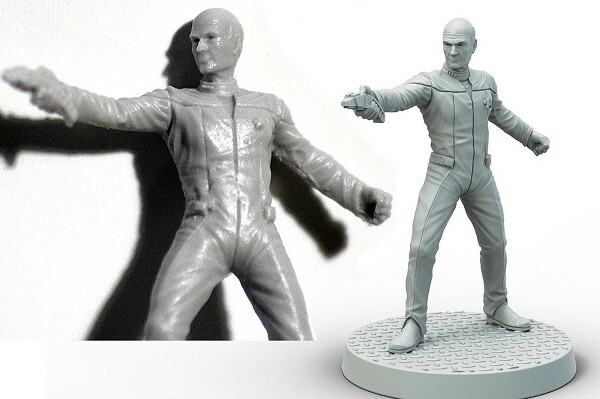 Even at resin, though, I'd be dubious of any claim at coming out with minis that REALLY look like the CGI previews (i.e., with a face sculpted so well you can recognize it as Patrick Stewart's) at any scale smaller than 54mm. As for myself, I'm going to try to paint my minis, and neither my eyesight nor my skill is all that great, so a lot of those super-super fine details are NICE, but probably would be wasted on me anyway. My goal is "good enough for table top," and most of the time the players aren't going to be holding my minis up mere inches away from their eyeballs to survey every last detail. Therefore, I'm more interested in getting more and cheaper miniatures, so I'm willing to make the trade-off to get some plastics that might not look exactly like the CGI previews. Or at the very least, the sort of difference between CGI preview and actual mini that you've shown by way of example isn't enough to get me to panic and jump ship: a Corvega should still look like a Corvega, that Red Rocket station still looks nice, and those minis from the demo game photos still looked nice enough that I'd happy paint them up, given a chance. Hi there here's an example of the pre-production T60 with render comparison. Bear in mind these are not final production but run off with quick test moulds just before GenCon. The gatling laser has a bend in it which is being re-printed for production. 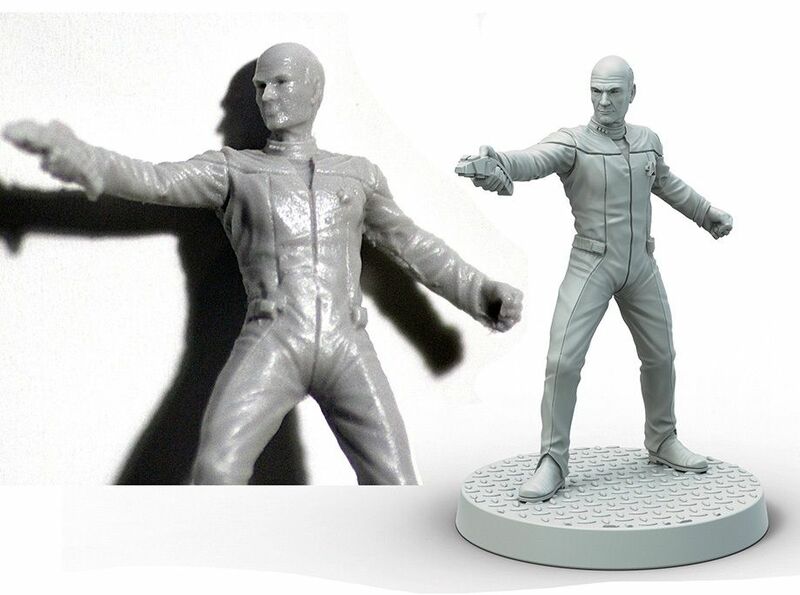 Picard miniature is resin. T60 armour looks acceptable even the BOS symbol is damaged. Wow. I love that the CGI detail on the *BASE* is being faithfully reproduced as well (and it's not just "generic mix-and-match" on the bases). The bases, I think, add a WHOLE lot of character, as they're essentially little snapshots into the Fallout environment that these characters "live" in. The warping on the gun is a bit sad, but I can understand how that might happen on a prototype rushed for a convention. I'm guessing that this could be a resin cast with flexible mold material (e.g., RTV silicone mold), either without a shroud (relying instead on the thickness of the mold to hold its own shape), or else where there was a flaw in the making of the shroud, or nesting the mold pieces therein. Either that, or else there was some sort of glitch in the 3D printing of the master? 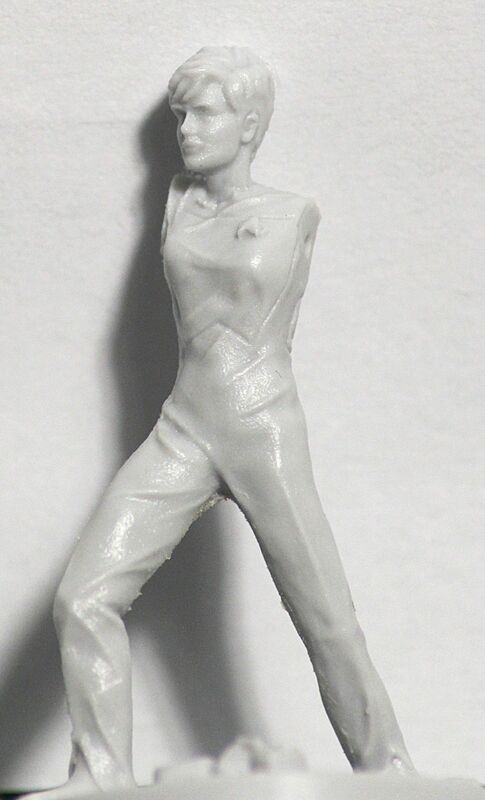 My friend took a closer look of other Trek miniatures in the same box and Tasha Yar character looks good. Some miniatures are good and some not so good. Perhaps it was just a bumpy start. But back to Fallout. Bases... They are cool but also I like to make my own bases but it would be shame not to use cool Modiphius bases... but I like to make my own bases... loop. Ok after painting I think I'll put some static grass in strategic spots. Name Modiphius is tricky. I'm constantly saying it like Mobidhius. The CGI and test print look pretty decent. If that test print is what can be expected I feel a little relieved. Granted the T60 Armor has large flat surfaces (for the most part) that are not terribly detailed. I would like to see the minis that were on display at Gencon, maybe some comparisons of the survivors and Dogmeat, or even the Deathclaw and Super Mutants. These are characters that lend themselves to a greater level of detailing that can be easily washed out in the molding process. Granted, most of us are likely going for the "good enough for tabletop" look. However, details pop out and add immersion to play sessions. My fingers are crossed that all the minis maintain at least the standard that is shown in the T60 example.